Basalt roving is a bundle of continuous monodirectional complex basalt fibers. Roving possesses high natural strength, resistance to aggressive environments, long service life and excellent electric insulating properties. By its technical characteristics, Basalt roving surpasses S-glass and E-glass by many parameters, and is almost as good as carbon. Basalt roving is extremely heat resistant: long-use temperature range is 200-680 deg.С. Temporarily it can work in up to 900 deg.С. Roving is extremely hard: 8-9 on the Moh scale (for comparison diamond=10). Its specific strength is 2,5 times higher than alloy steel’s and 1,3 times higher than E-glass. 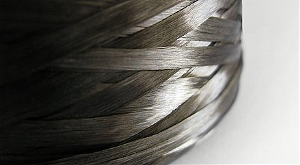 Discontinued Basalt 3-ply rope. Made from 3 plies of 4800 tex 16 micron roving, total tex 14,400. Yields approx. 220 feet per kg. Packed on bobbins ranging from 8 to 11 kg. 1800-2400 feet per bobbin. Basalt 3-ply rope. Made from 3 plies of 6400 tex 16 micron roving, total tex 19,200. Packed on 7 kg bobbins.